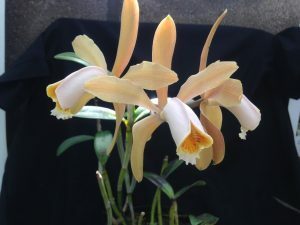 Cattleya forbesii is a smaller growing bi-foliate (two leaved) Cattleya that comes from Brazil. It is found as a lithophyte or epiphyte in coastal forest in the Mata Atlantica – a habitat that has largely disappeared in the past 200 years. It therefore enjoys being warm and bright but given plenty of water during the summer growing season. Our plants hang in baskets in our Warm Americas section. 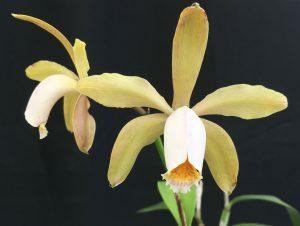 The flowers are quite variable in shades of green, yellow and brown and are around 7cm across but are very attractive and well grown plants can produce six flowers per spike.